Although they only require 3 ingredients and 15 minutes to prepare, these chocolate-covered strawberries make one classy dessert. Dip bottom 3/4 of each strawberry into white chocolate; place on waxed paper-covered baking sheet. Refrigerate until firm. Melt milk chocolate as directed on package. Dip 1 side of each berry in milk chocolate, then turn to dip other side, leaving "V"-shaped white center. Return to baking sheet. 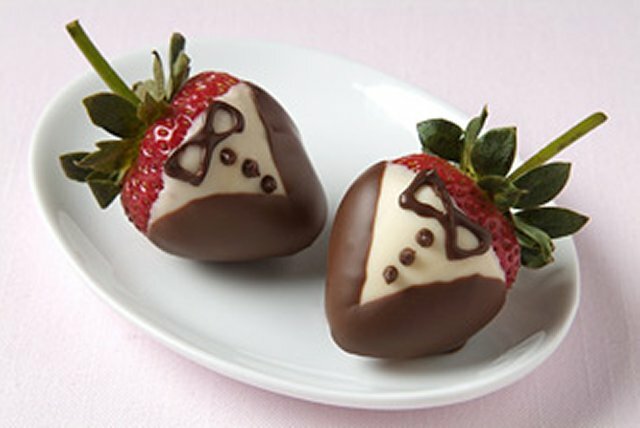 Use toothpick dipped in remaining milk chocolate to draw buttons and bow tie on each berry to resemble tuxedo. Refrigerate until firm. These chocolate-dipped strawberries make great treats to serve a crowd on a special occasion. Cool any remaining dipping chocolate. Cover with lid. Refrigerate up to 2 weeks. To re-melt, follow directions on package. Prepare recipe as directed, using 6 oz. each BAKER'S White Chocolate and BAKER'S Semi-Sweet Chocolate. Melt each (separately) as directed on package before using as directed.